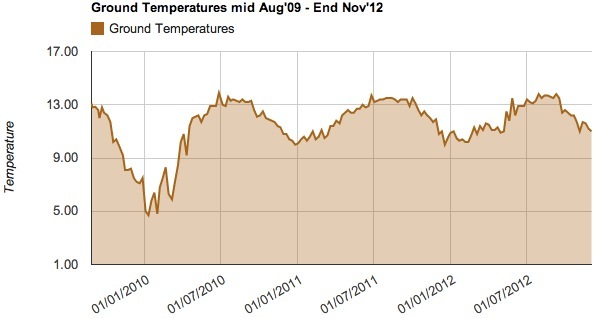 2 Dec 2012: The ground temperature is doing quite well considering how grim the summer was - it is still 11ºC…. I usually test on a Sunday night at midnight, and we have been lucky with some sunny Sundays, even if mid week was raining. 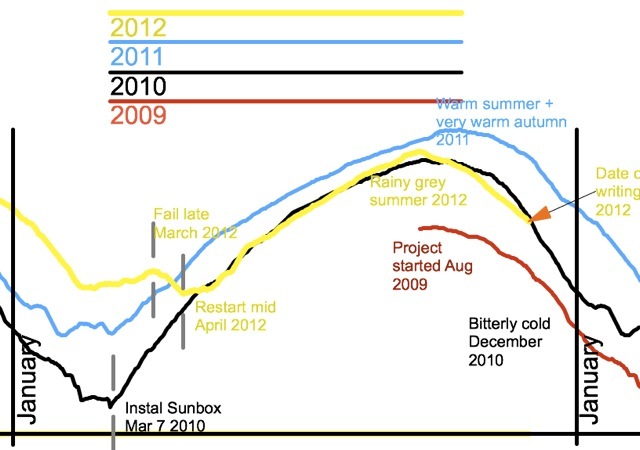 The ground temperature graph from August 2009 to the start of December 2012 shows how consistent the temperature has been since the Sunbox was installed, despite the variations in climate. Ground deep down below is not really affected by annual temporary climatic variations, the difference to the temperature is made by the amount of energy that the house demands of the heat pump, i.e. the house demand is governed by the weather, and if it is cold, the house demands more! Energy levels over three years in a sequential line. In both the above graphs, the downward 'blip' which occurred when the Sunbox was out of action for a month in Mar-April 2012 is very visible. Energy Levels in the 3 years, overlaid for comparison. These are derived from my ArchiCAD thermal model written during summer 2012. Each year is colour coded. These do show the variations in weather during the three years. As I look at the colours, I can recall the weather. 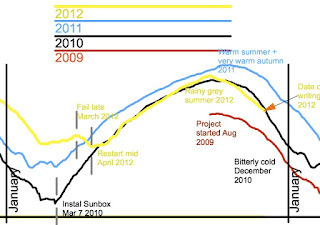 The Red line is 2009, prior to the Sunbox installation - the curve follows a familiar shape, but consistently lower than in the later years. The autumn was a fairly gentle slide into winter. The Black line is 2010, the year of 'two winters' - which started with a very cold January and spring (snow and freezing temperatures) and in the same year we had the coldest December on record - so there is a steep fall in the last month. We had a reasonably sunny summer, so the energy level was lifted as soon as the Sunbox was operating in March April 2010. 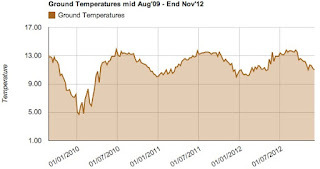 The Blue line was 2011 which was thermally mild all through the cold seasons and with a fine summer. It did not begin to get cold until mid December. NiCad Battery is charged and working!